A healthy, hearty vegetarian breakfast ready in just 35 minutes! Heat 1 tablespoon olive oil in a large oven safe pot over medium heat. Add onion along with a pinch of salt and pepper and cook, stirring frequently for 4 minutes. Add potatoes, the remaining tablespoon olive oil and a large pinch of salt and pepper. Then add cumin and chili powder and stir to combine. Cook potatoes, covered, over medium heat for about 15 minutes, stirring occasionally. Add a splash of water as needed if the pan is getting too dry. Remove the potatoes from the heat when they are just slightly under cooked, as they will continue cooking in the oven. Add corn and black beans to the pot. Then drizzle with enchilada sauce and top with pepper jack cheese. Make 6 wells, one for each of the eggs. Crack an egg into each well. Season with salt and pepper. Bake, uncovered, for about 12 minutes depending on how you like your eggs. 12 minutes seems to be the sweet spot for our oven – leaving the whites of the eggs set and the yolks runny. Garnish egg bake with crumbled queso fresco, fresh cilantro, sliced jalapeno and pico de gallo and enjoy! If you’re substituting another kind of potato, be sure to watch the cook time when the potatoes are sauteing on the stove top. Depending on the potato you use (Russet, sweet, frozen, etc.) your cook time may be longer or shorter than the recipe specifies. You’ll want to pull your potatoes off the heat just before they are fully cooked as they will continue to cook in the oven with the eggs. Feel free to add a couple splashes of water as you’re sauteing the potatoes. All that seasoning is going to give them lots of flavor, but depending on what kind of pan you’re using, it may cause the potatoes to stick. You can remedy this with a splash of water here and there to delgaze the bottom the pan. Everyone likes their eggs cooked differently. This recipe will give you runny egg yolks with a set egg white. If you prefer a yolk that is set just bake the breakfast casserole for another 3 to 5 minutes. 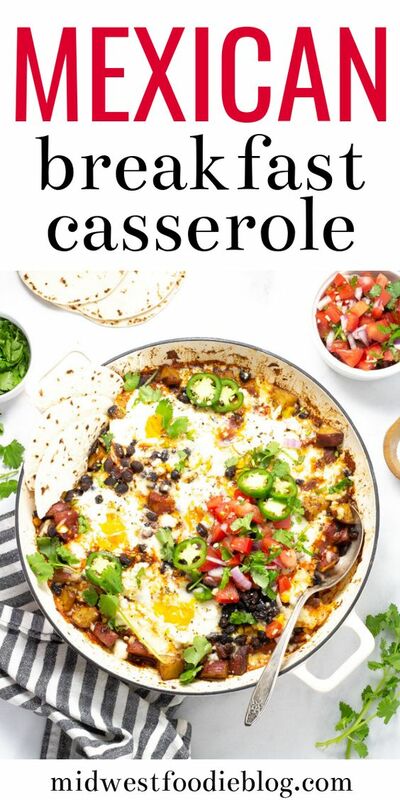 If you’re more into scrambled eggs you could even add the eggs to a bowl and whisk them together and then pour them over the Mexican breakfast bake. It won’t give you a quite the same visual effect (as the entire top will be covered with eggs) but it will still taste delicious! If you’d like to make this ahead of time: Follow recipe instructions and before cracking the eggs into the wells, cover and refrigerate for up to 5 days. An hour before you’re ready to bake, remove casserole from the fridge and let it come to room temp. Crack eggs into the wells, season with salt and pepper and bake!